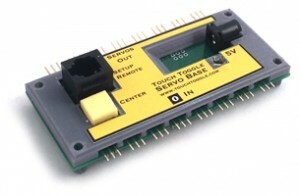 Our Servo Control Base uses Touch Toggle controls to operate common R/C servos. Touching each Toggle moves the attached servo from one pre-set position to a second position. Touching it again returns the servo to the first position. Each servo moves to the position you’ve set for red and green positions at the speed you’ve set. Servo Control bases support 8 Touch Controls and 8 servos each. Berrett Hill offers small servos separately or in bundled packages. We also have Well Servo Mounts and Under Table Servo Mounts to help model railroaders install their servos for turnout operation. A “center” button on the base centers all connected servos and lights all connected touch controls. This makes installation of both servos and lights much simpler. Each Base requires a 5v power supply. Connected servos can be any size with a maximum power draw of 2 amps total. Be sure to review our Servo Control Packages for better offers on grouped items! We manufacture our products in the USA. Orders over $100 include free shipping to US addresses.